I can’t believe that in 2010 I only updated this blog four times. Every few weeks someone reminds me of how much they love this blog, even through its long silences, so darlings, I am listening. Yes, this blog still lives, and I still live here in Beijing. In the meantime, Beijing has actually become quirkier. Hurray! Check out this take on the classic Beijing bus sign. 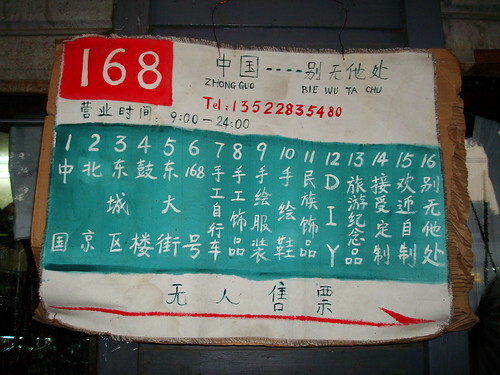 If you can read the Chinese, from left to right, this bus sign gives the address of the little shop in Chinese (168 Gulou Dong Da Jie), then describes what the shop sells (a mix of handmade items), and ends with 别无他处 （nowhere else). I like to interpret this as meaning that the shop would rather be here rather than anywhere else. No Comments on "中国－别无他处 China – Nowhere else"